I sometimes find it difficult to sew for baby boys. One problem is that you can’t add too many cute frills because people might find it too girly. The second problem is that dresses are somehow just more fun to make. I usually end up making another Growing up sew liberated envelope tee. However, my colleagues have been creating a lot of boys lately so I’ve already given several of these tees away. It was high time for some diversification or risk people thinking I am a one-trick monkey. I still had some of the coronavirus fabric that would be great to use for a boy but the amount was somewhat limited so not every pattern was going to work. After much deliberation I chose blouse 6 from Knippie 5 2010 in size 74. If you compare the shirt I made with the line drawing you might notice that my version doesn’t look all that much like the drawing. First, I made short sleeves because of fabric limitations. Second, I don’t really like the western cowboy details so I left these completely off on the front and changed the curved yoke to a straight yoke and cut the back piece on the fold. I considered leaving out the yoke completely but inside yokes are pretty useful for embroidering sizes on so that persuaded me otherwise. I didn’t like the square pocket so left it off as well. In the pattern the front placket facing is cut separately which I really don’t understand when you don’t use a contrasting fabric (bulk, extra sewing, seriously why?) 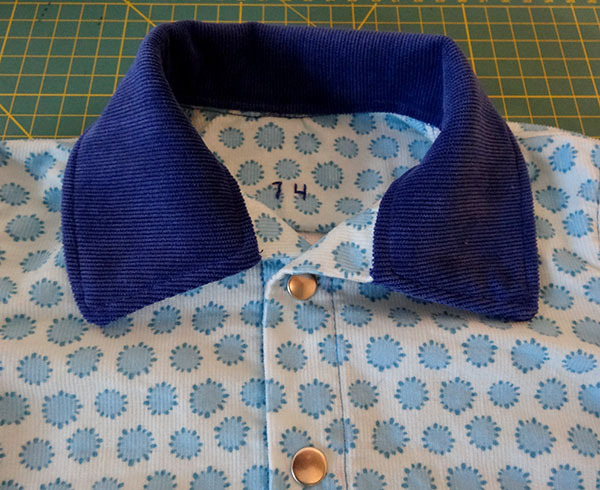 so I merged the front and front placket pattern pieces. On the sleeve piece some of the notches were missing but I didn’t have any trouble putting them in, it just took a little bit more care to get things properly aligned and eased in. I didn’t have suitable buttons in my stash and used snaps. This is possibly also a safer option in clothes for young children but I found it a bit challenging and time consuming to get them all spaced equally. Don’t do this bit when you’re in a hurry. They look really good though. I placed the top snap a bit lower than they did in the line drawing because I don’t think baby’s like having a collar really tight aroung their neck. I didn’t follow the Knippie assembly instructions. According to them topstitching of the collar is optional. Optional??? Not in my book. 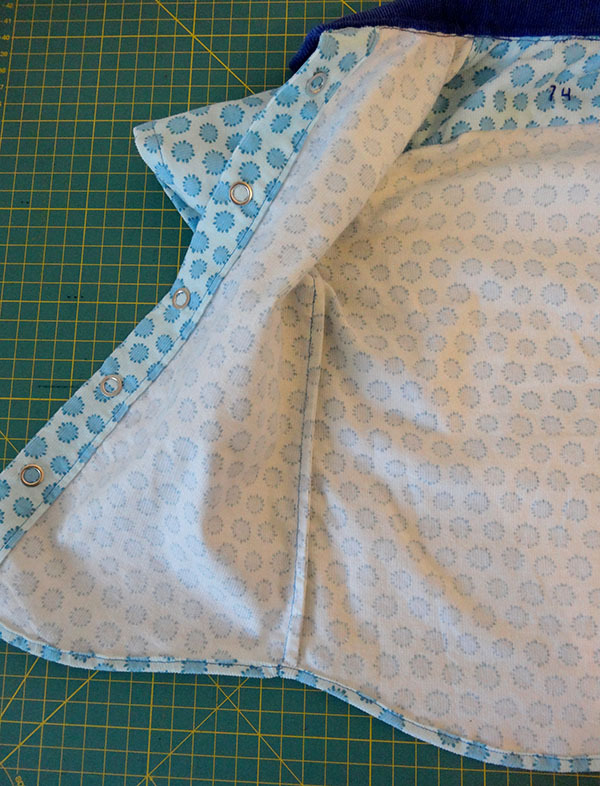 I used French seams for the side seams and the yoke trick (also called burrito method) for the shoulder seams. This encloses all seam allowances which looks really great in my opinion. The seam allowances of the sleeves were overlocked and then topstitched in place. There are two things that I am not completely happy about. I accidently cut the back yoke piece upside down (getting creative with limited amounts of fabric does have its risks…). Luckily little kids mostly lie on their backs right? I also should have used a lighter thread for attaching the collar because on the inside you can now see the stitching line. Other than that I think it turned out very well and I will probably use this pattern again. 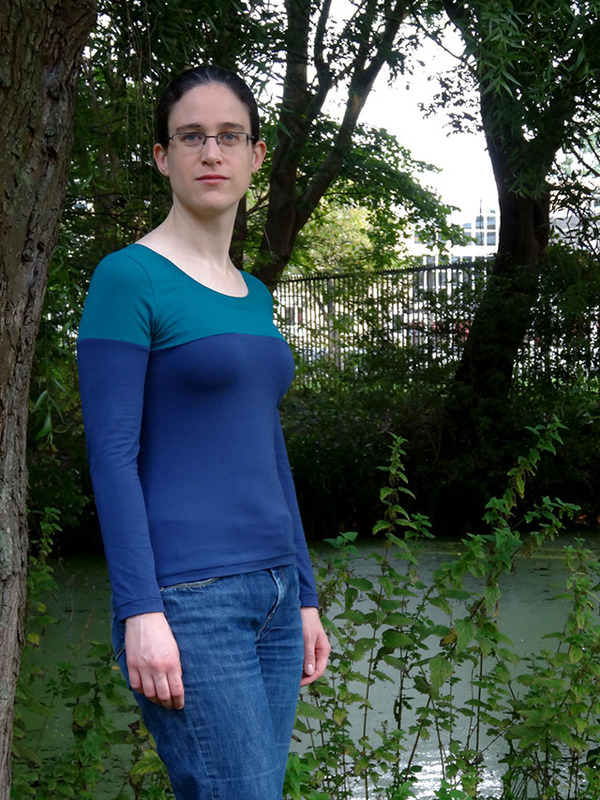 I needed some simple projects to get going again and decided to fill a gap in my wardrobe: long sleeved t-shirts. Useful when it gets a little bit colder and a short sleeved t-shirt doesn’t provide enough coverage anymore but a cardigan or sweater is still too warm. If you have been following this blog for a while you may have noticed that I usually use solid colours when sewing for myself and that I am not averse to some colour blocking. To make this t-shirt I used the same pattern as before but adapted it to give the top of the t-shirt a different colour. I even remembered to take some progress pictures so I could show you how I changed the pattern to achieve this look. 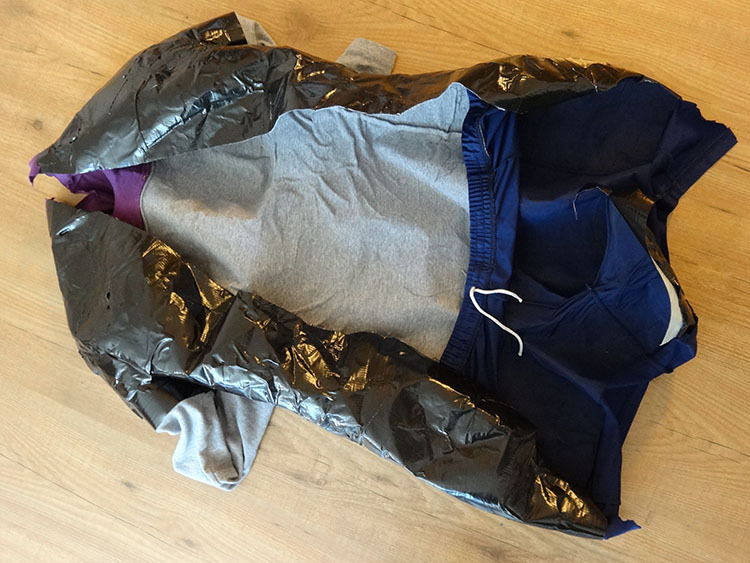 This is a very easy method to give your favourite t-shirt (or dress) a different appearance. 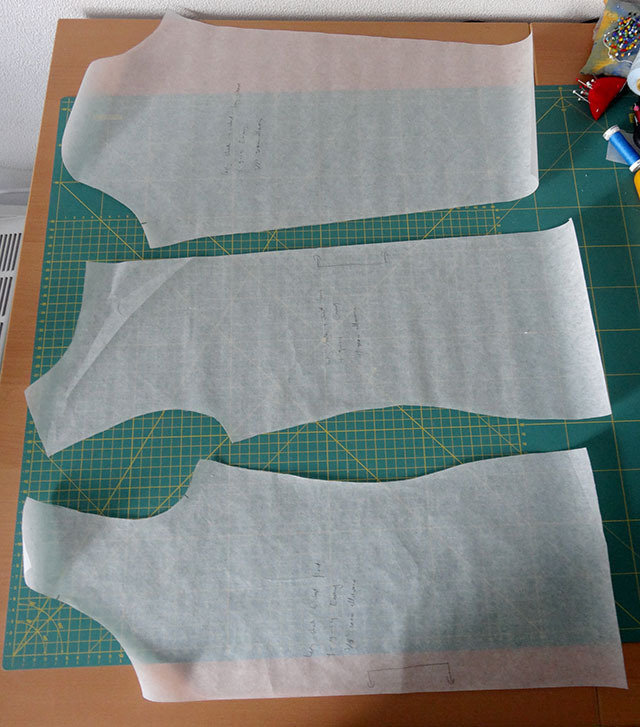 The second step is to decide where you want to cut and mark this position on all pattern pieces (front, back and sleeve). I made a mark ¾’’ below the armpit. You could cut a little bit higher than that, but I would advise you to take into account that you are introducing extra seam allowances inside the shirt and you don’t want all of those to meet exactly at the armpit because that will become very bulky which is a pain to sew and might also not be too comfortable when wearing. 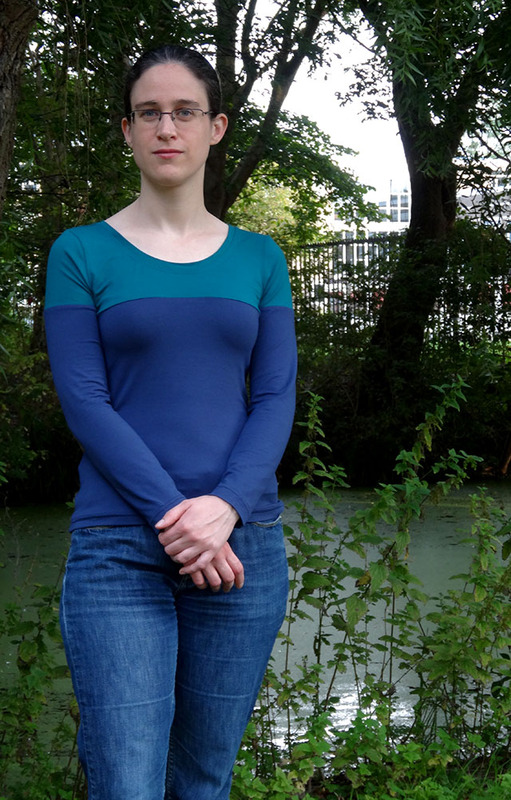 If you only want a small strip of the second colour at the top you can also cut above the armpit. Check that the marks you made on the front and back bodice match and that the marks you made on the sides of the sleeve match as well. Mark a certain distance away from the armpit and check on front and back bodice (and sleeve) whether the marks match up. Draw a line across the pattern pieces through the mark and cut the pattern. Make sure that both sides of each pattern piece are labelled correctly. My pencil marks aren’t very clear but I first drew the cut line with pencil. The Lady Skater pattern has the seam allowance included in the pattern. 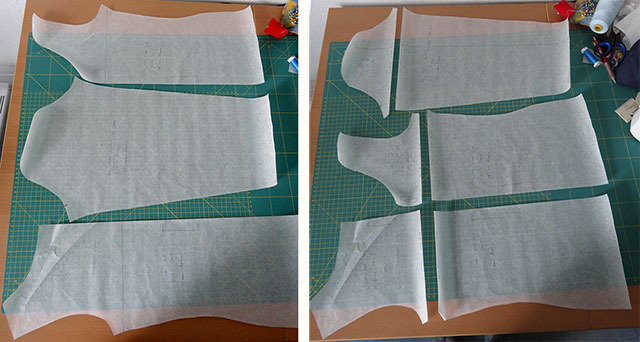 However, where I cut the pattern, the seam allowance is not yet included. 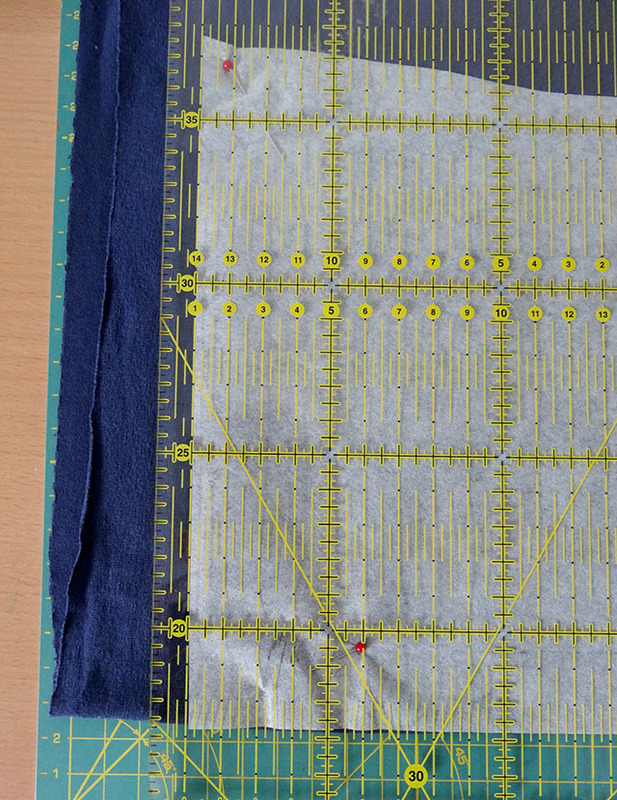 This means that I have to remember to add the appropriate seam allowance when I cut the pattern from fabric. I use a quilting ruler and rotary cutter to get a straight cut. You can also tape some extra tracing paper to the pattern and add the seam allowance to the pattern if you worry that you’ll forget. 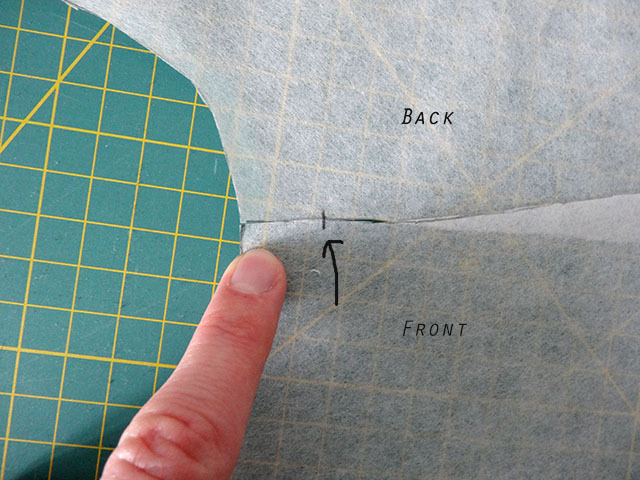 Add seam allowance to side that was sliced. 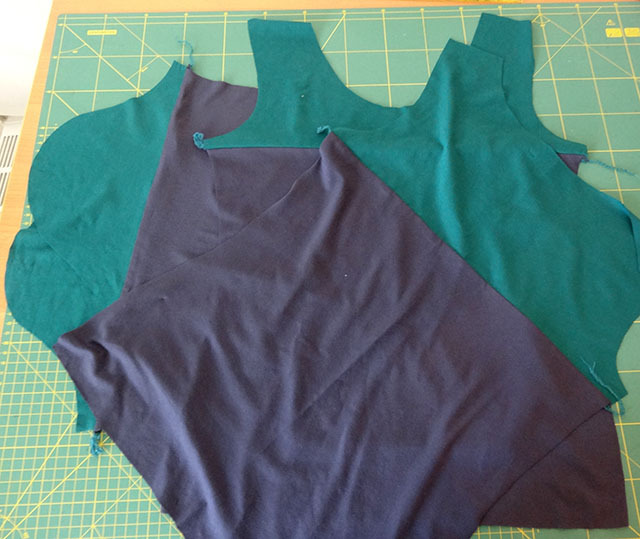 I chose to first sew top and bottom of each pattern piece together before assembling the t-shirt. You could topstitch the seams but I didn’t. For another look you could also only do this modification to the bodice to get a differently coloured yoke and leave the sleeves as they are. A title like this could contain a very sinister story but in our case it was my idea to wrap duct tape around me. If you are a garment sewer you might already have guessed that I was after a dress form. I aim to make clothes that fit but the fitting process can be quite lengthy if you have to fit yourself. For me it usually includes sewing a muslin, putting it on and going to our bedroom that has a full length mirror to see how it fits. With just one mirror it is, however, quite difficult to assess fit because you can’t really judge the fit from the side and back because you distort the garment when bending your head and body in an attempt to see what the garment looks like. Usually, I’ll go downstairs to take some pictures so I can assess what the garment looks like from those angles. I find pictures really helpful to assess fit issues. When the fit issues are clear it is time to make adjustments. It is easiest to make adjustments to a garment when it is on a body. When the garment is on your own body that does create some challenges. Adjustments to the front are usually doable. I’ll do them in front of the aforementioned mirror (all the while worried that I end up leaving pins in our bed, on my boyfriend’s side…). Adjustments to the back are more difficult. Most places are problematic to reach without ending up with a back injury so it often involves a lot of taking the garment off, guessing what needs to be done, trying it on (often also taking more pictures) and then trying something else. This can go on for quite a long time because I’m also still learning how to fix certain issues and a lot of what I do is trial and error. I’ve been thinking for a long time that a dress form would be extremely helpful to decrease the time spent fitting. If I can make the initial large adjustments on a dress form and only have to do the final tweaking on my own body the whole process should go a lot faster. My first thoughts went to a commercial dress form but I quickly realized that even if they are of the adjustable variety I’ll never get one that is exactly like my own body. 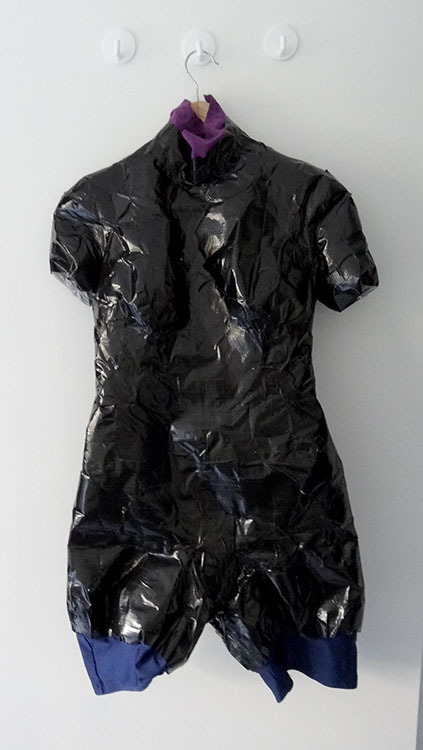 I think the future of dress forms will include a body scanner and a 3D printer that recreates your body to perfection but I haven’t been able to find a company that already offers this (and at first it’ll probably be insanely expensive) so I went with the next best thing: duct tape. 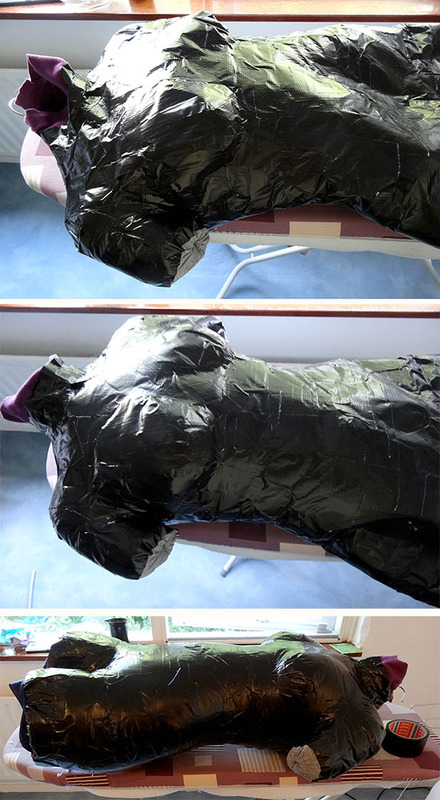 There are loads of tutorials out there on how to make a dress form using duct tape so I’m not going into all the details here. I’ll just give three top tips. Use a close fitting t-shirt as a base and not a garbage bag. The fabric of the t-shirt adds a lot of support to the duct tape shell and I believe this helps the form to keep its shape. Use non-stick scissors when you cut the dress form open to get out. Lastly, when closing the cut, start taping from the inside with the small lengths of duct tape and try to align the cut as best as you can. If you are happy with the alignment, put some tape on the outside as well, then move onto the next segment. Taping from both sides will make the seam stronger and you’ll have less chance the form will pop open at some point. Cut open dress form. I later cut off the top of the pants that wasn’t attached to the duct tape. 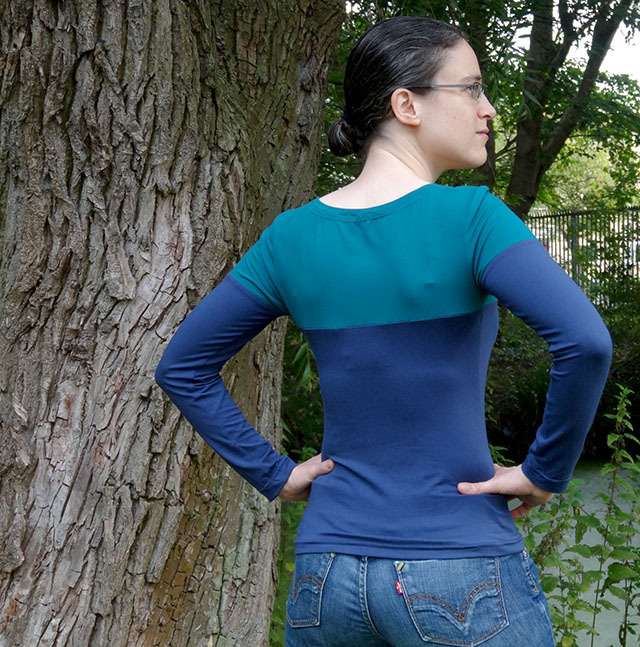 I started with a long sleeved scoop neck t-shirt but sewed some ribbed knit onto the neckline to create more of a turtle neck because I wanted to include part of my neck in the form (it’s easier to start with a turtle neck but I didn’t have one). Because my hips are the widest part of my body I find they also affects how tops look on me so I decided to include my hips and upper legs in the form as well so I also wore close fitting sports pants. You should choose someone you trust to do the taping because it’s quite an intimate process. It was also a bit scary to have someone use scissors this close to my bottom. Getting some shape as the form is stuffed. My form was stuffed with filling from old pillows and some stuffed toys filling. I chose to put a hanger inside so I can hang the form somewhere when fitting. If you don’t include the legs you could also make it so it stands on a desk or insert a stand. In a future sewing room I’ll probably make something on the wall so I can hang the form permanently. For now I’ll make do with a hook a previous tenant left in our bedroom ceiling. The only thing she really lacks is collapsible shoulders, but I think that feature will have to wait until those body scanning companies are up and running. Do you have a dress form and do you find it helpful for fitting?